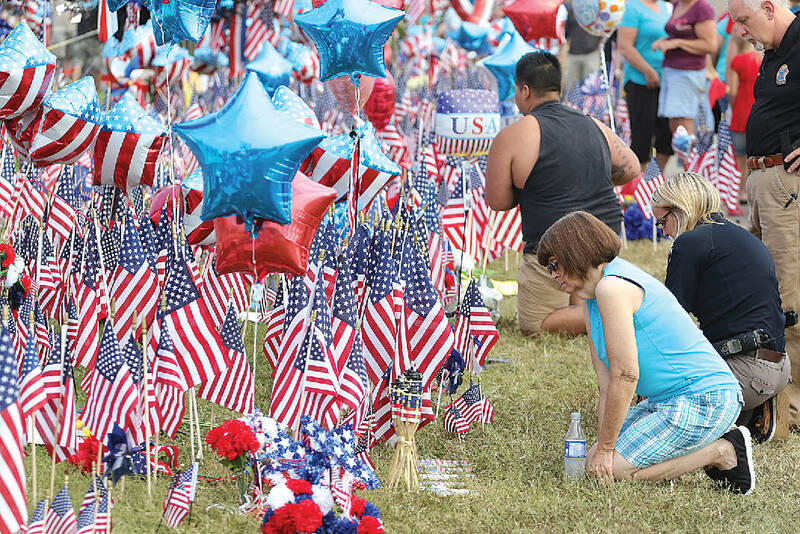 Mourners pay respect to the five soldiers killed July 16, 2015, at the U.S. Navy Reserve center on Amnicola Highway in Chattanooga. A gunman, Mohammad Youssef Abdulazeez, unloaded dozens of rounds into two military facilities and was killed after engaging police and members of the military in a firefight. ATLANTA — It can sometimes seem as though mass shootings are occurring more frequently. Researchers who have been studying such crimes for decades say they aren't, but they have been getting deadlier. In the five years since a gunman killed 20 children and six adults at a Connecticut elementary school, the nation has seen a number of massacres topping the death toll from Newtown and previous mass shootings, many of them involving rifles similar to the one used at Sandy Hook. A mass shooting is widely defined as one in which four or more people are killed in a public place, excluding domestic violence and gang-related violence. Chattanooga saw its own mass shooting July 16, 2015, when 24-year-old Mohammad Youssef Abdulazeez opened fire on two military sites, killing five service members. Killed in the attack were Sgt. Carson A. Holmquist; Gunnery Sgt. Thomas J. Sullivan; Staff Sgt. David A. Wyatt and Lance Cpl. Squire K. "Skip" Wells, all Marines; and Navy Petty Officer 2nd Class Randall J. Smith. Americans wanting to know why deadlier mass shootings are happening will get few answers. Is it is the wide availability of firearms? Is it the much-maligned "assault weapon" with its military style? Is it a failing mental health system? 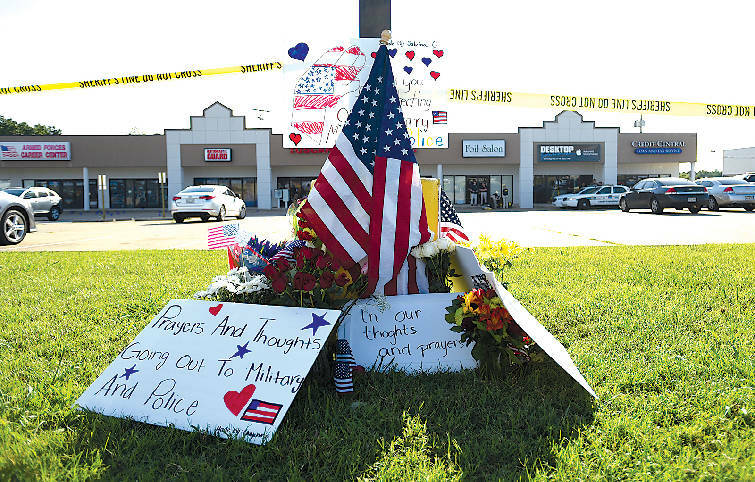 A memorial to the July 16, 2015, shooting victims was erected in the parking lot near the Armed Forces Career Center on Lee Highway. That's where a gunman fired several rounds into the building before killing five troops at a second location on Amnicola Highway. "We're kind of grabbing at straws at this point in terms of trying to understand why the severity of these incidents has increased," said Grant Duwe, a criminologist who has been studying mass killings since the 1990s. The federal government does little research on the matter, because a measure dating to the 1990s had the U.S. Centers for Disease Control and Prevention retreat from firearms research. Instead, a handful of academics, like Duwe, have toiled sometimes for decades with limited funding trying to better understand why these shootings happen and how to prevent them. "There are lots of people who are isolated, don't have lots of friends, who don't smile and write ugly things on the internet and blame others for their misfortunes and don't want to live anymore and talk about mass killers and maybe even admire them," said Northeastern University professor James Alan Fox, who began studying mass shootings in the 1980s and has written six books on the topic. Five years ago this week, Adam Lanza, a troubled young man in Newtown, Conn., shot and killed his mother in their home and then drove to Sandy Hook Elementary School with an AR-style long gun and a handgun. He fatally shot 20 children and six educators, then himself. The rate of mass shootings has remained steady at about 20 per year for the past three decades, Fox said. Still, five of the 10 deadliest have occurred since Sandy Hook, he said. "Some years are worse than others, and bad years tend to be followed by not-so-bad years," Fox said. While two of the deadliest took place this year, "you can't take the actions of one or two people and call it a new phenomenon. That's aberrational. You can't make any pattern or trend based on that." It's unclear whether the higher death tolls are the result of more firearms being available or firearms being more effective. Stephen Paddock, the Las Vegas shooter, used bump stocks to allow a number of his guns to mimic fully automatic weapons, but his perch high above the outdoor concert also made the shooting more effective and deadly. That's the tactic the gunman in the 1966 University of Texas at Austin shooting used when he took to a tower overlooking the campus, shooting down for more than 90 minutes. In half of the deadliest mass shootings, the perpetrator used at least one AR-style firearm. In one, the massacre at a McDonald's in San Ysidro, Calif., in 1984, the shooter used an Uzi submachine gun. The others were carried out with handguns, the weapon used in the majority of mass shootings. "Contrary to what some folks may think, the incidence of mass public shootings has not increased since Sandy Hook or even the five years before that," Duwe said. "What has changed — and this is certainly true around the time of Sandy Hook and even since then — the severity of mass public shootings has certainly increased. That is one genuine change we've seen." The reason why someone carries out a mass shooting has been elusive, and it's a question she hopes the research will help answer. Are mass shooters of today and the future bent on outdoing previous slayings by inflicting higher death tolls? That, too, is unclear. She cautions that such questions and answers continually evolve. "This is ever-changing," Peterson said. "Just because we understand it today, we might not understand it tomorrow. That part gets hard. This is changing as society changes." Five of the 10 deadliest mass shootings in modern U.S. history have occurred since 2012, the same year a troubled young man killed 20 children and six adults at an elementary school in Newtown, Conn.
» Oct. 1, 2017: Stephen Paddock opened fire on an outdoor music festival on the Las Vegas Strip from the 32nd floor of a hotel-casino, killing 58 people and wounding more than 500. SWAT teams with explosives then stormed his room and found he had killed himself. » June 12, 2016: Omar Mateen opened fire at an Orlando, Fla., nightclub, killing 49 people. Mateen was later killed in a shootout with police. » April 16, 2007: Virginia Tech student Seung-Hui Cho shot and killed 32 people and wounded 17 others in separate attacks on campus before killing himself. » Dec. 14, 2012: In Newtown, Conn., an armed 20-year-old man entered Sandy Hook Elementary School and used a semi-automatic rifle to kill 26 people, including 20 first-graders and six adult school staff members. He then killed himself. » Nov. 5, 2017: Devin Patrick Kelley, who had been discharged from the Air Force after a conviction for domestic violence, used an AR-style firearm to shoot up a congregation at a small church in Sutherland Springs, Texas, killing more than two dozen. » Oct. 16, 1991: George Hennard drove his pickup truck though the front window of Luby's restaurant in Killeen, Texas, and then fatally shot 23 people, wounded 27 others and then killed himself after a shootout with police. » July 18, 1984: James Huberty drove to a McDonald's in the San Ysidro neighborhood of San Diego, Calif., armed with an Uzi submachine gun, a shotgun and a handgun. He shot and killed 21 people, injured 19 and then was killed by a police sniper. » Dec. 2, 2015: Syed Rizwan Farook, 28, and Tashfeen Malik, 27, opened fire at a social services center in San Bernardino, Calif., killing 14 people and wounding more than 20. They fled the scene but died hours later in a shootout with police. » Aug. 20, 1986: Postal worker Patrick Sherrill shot 20 co-workers, killing 14 of them, in Edmond, Okla. He then committed suicide. » Aug. 1, 1966: Charles Whitman, a onetime Marine sharpshooter, opened fire on the University of Texas at Austin campus from its clocktower, killing 13 people and an unborn child and injuring around 30 others. Whitman also killed his mother and wife the night before. One shooting victim died a week later and medical examiners attributed a 17th death to Whitman in 2001.